Remember Me? NOTE: Only AUTHIORS can log in, in this site. Welcome to the M1911.ORG Electronic Magazine, our electronic publication, where we post reviews of M1911 pistols, articles of general shooters interest etc. This site is a read-only site, so you do not have to register or to log in, to read its content. The log in space at right, IS FOR AUTHORS ONLY, instead we urge you to register with our Forums Site. If you intend to buy something from Brownells, Cabela's, Blue Ridge Firerarms or Field Supply, please use their banners in our sites. Whatever you buy from them, gives us a small commission, which helps us keep these sites alive. You still pay the normal price, our commission comes from their profit, so you have nothing to lose, while we have something to gain. Also, don't forget to visit our other sponsors sites, click-throughs are appreciated by our advertisers. Your help is appreciated. Our evaluation team received Ruger SR1911 S/N 670-03173 for examination. The pistol is attractive, with subtle markings and a medium-matte stainless steel finish on the slide and frame. The stainless color is accented by black-finished sights, slide stop, thumb safety, hammer, grip safety and mainspring housing. When held, the SR1911 has a very smooth, comfortable feel. The pistol has been subtly dehorned. The only sharp edge is the top rear of the ejection port. Crimson Trace LaserGrips added by Drake. The SR1911 is made completely in the United States (the zipper case does come from China). The slide is machined from stainless steel bar stock. The front and rear sights are mounted in Novak-pattern dovetails, though the sights differ in detail from the typical aftermarket Novak offerings. The rear sight was designed by Novak to Ruger’s specifications. The slide has slanted rear serrations, and does not have front serrations. Firing pin safety is achieved with a titanium firing pin of standard .45 ACP dimension, with a heavy firing pin spring. The extractor is internal, of standard M1911 design. 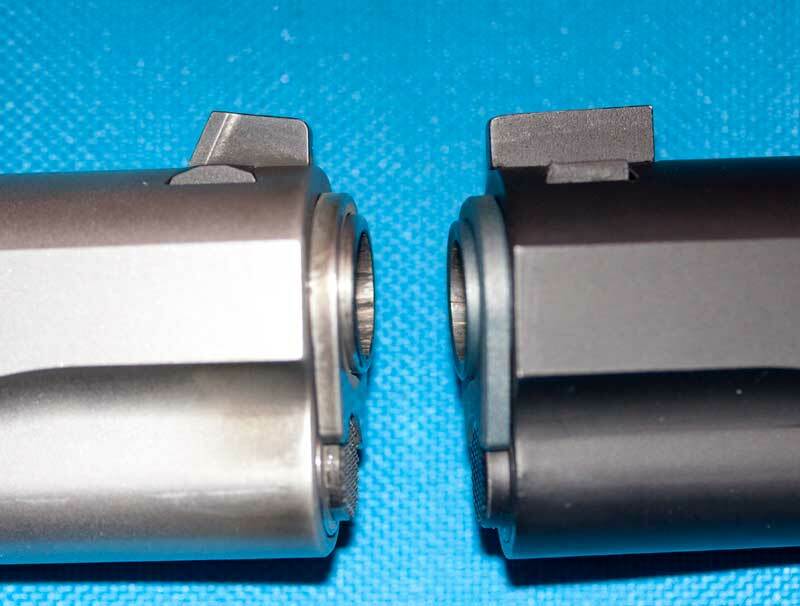 The barrel and barrel bushing are also of conventional M1911 pattern. The guide rod is the conventional short type, as is the spring plug. The guide rod is not beveled; however, because the guide rod does not contact the barrel lugs, the point is moot. The spring plug does not have an internal tab to engage the recoil spring. The clearance between the barrel bushing and slide is 0.006”. The clearance between the barrel and barrel bushing is 0.002”. 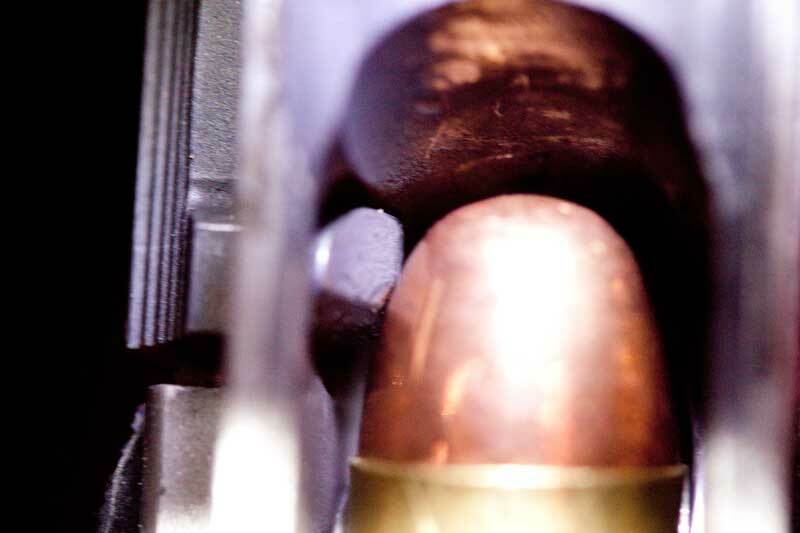 The recoil spring is estimated be 20 pounds (Ruger later verified that the spring weight is 18.5 pounds). The barrel rides the link on lockup rather than via the barrel lugs on the slide stop pin. The slide markings are light, thus they are easily removed for a custom build. The slide has a clearance flat for the front sight in front of the sight, but not behind the sight. 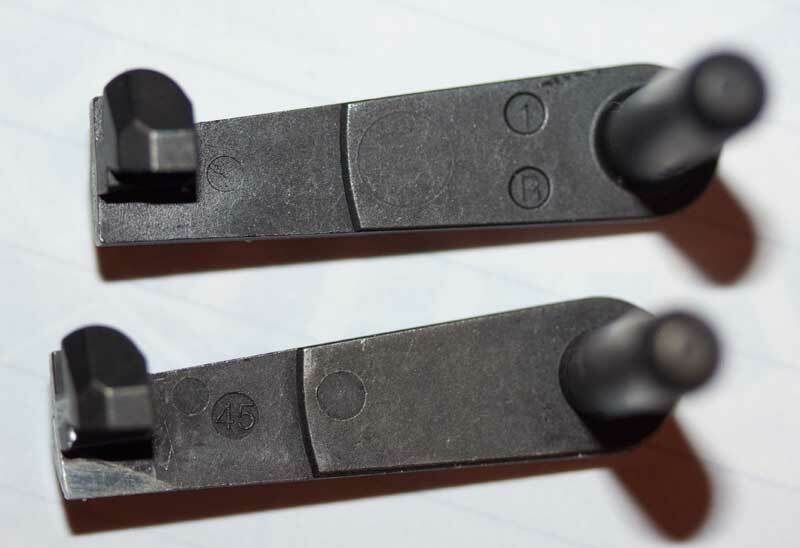 Aftermarket Novak-pattern front sights may require minor file or mill work to create the rear clearance flat. Note the lack of front sight rear overhang on the SR1911 (left) compared to a conventional Novak. The front sight lateral contour prevents the shooter from seeing the side of the sight and introducing azimuth (windage) error when tracking from one target to another. The extractor hook appears to properly engage the cartridge case. The extractor hook engaging a cartridge. The frame is machined from a stainless steel investment casting. The front strap has adequate thickness for custom textures. There is a bow tie cut in the Vertical Impact Surface. The barrel lugs strike the VIS properly. The trigger has a long aluminum shoe with lightening holes. The trigger is well-fitted, with minimum clearance vertically and horizontally. The trigger bow is a little tight on the supplied magazines and may catch the magazine lips as a magazine is inserted. The bottom of the ejector clears the inserted magazine lips. The magazine catch will trap the magazine if fully depressed. The grip safety is of beavertail design. There appears to be enough material to permit more complete blending of the grip safety and frame tangs. Neither of our test shooters had any difficulty adequately depressing the grip safety regardless of hand or hold. The thumb safety is single sided, and moderately enlarged. The mainspring housing is flat and checkered. Frame/slide clearance is 0.003” both laterally and vertically. The dust cover is 0.058” thick. Installation of a Dawson rail should be with larger 8-36 screws rather than the supplied 6-32 screws. The ramp depth is 0.400”. Trigger pull weighed in at 5.5 pounds as received and 5.25 pounds after 350 rounds. The thumb safety required 1 pound to engage, and two pounds to disengage. 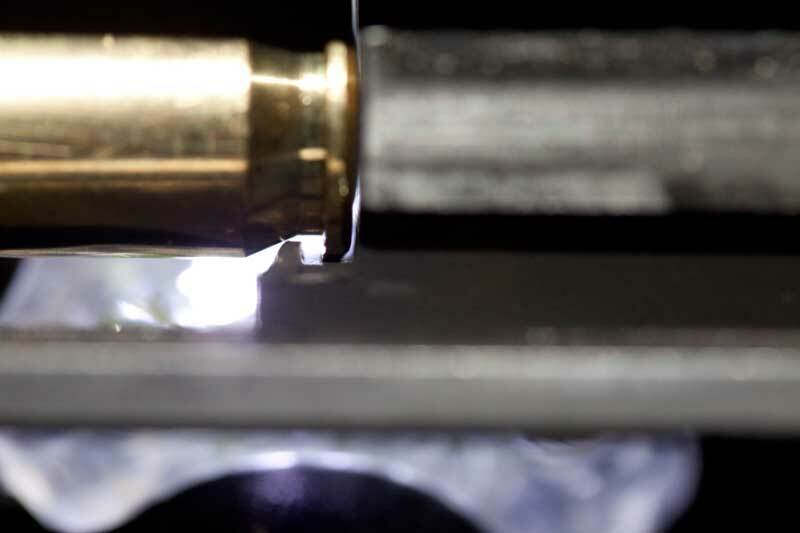 The frame tangs are cut for a standard 0.250” grip safety. The slide stop pin is undersized at 0.196”. The serial number marking is shallow. It appears that blasting for application of an aftermarket finish, or even the finish itself, will render the serial number unreadable. The sear, disconnector, hammer, slide stop, safety, grip safety, mainspring housing, front sight and rear sight are MIM. This cosmetic defect was seen on the top of the MIM hammer. 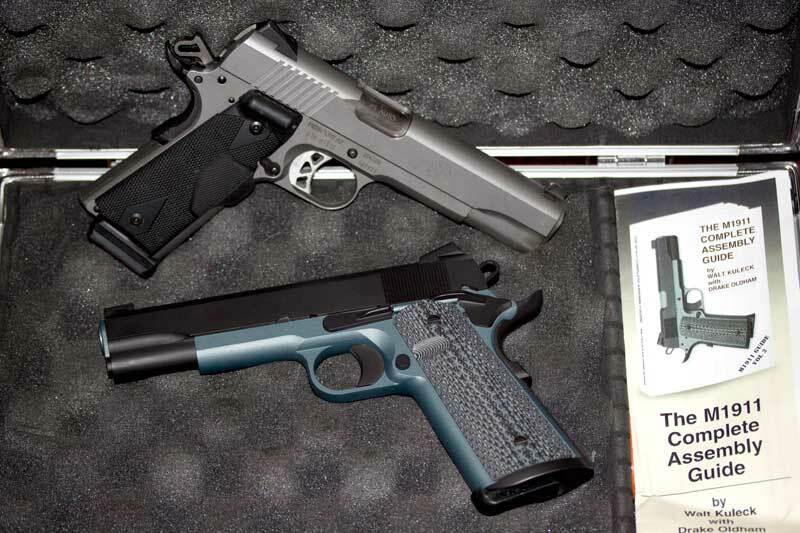 The SR1911 ships with one seven (7) round and one eight (8) round Checkmate Industries magazine. The magazine follower is Tom Vieweg’s Pat # 6,560,907, which is dimpled and skirted. The slide stop lug engagement surface of the follower is springy, which relieves stress on the slide’s slide stop notch. 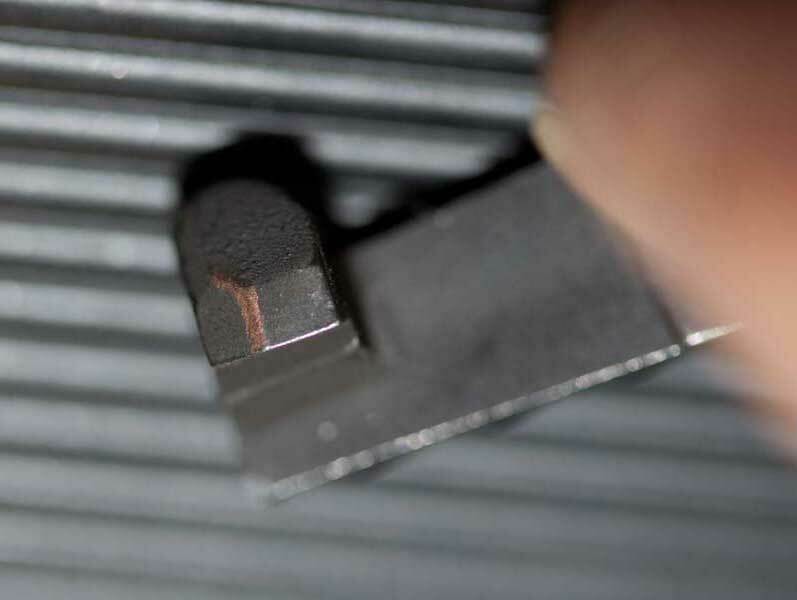 The slide stop is pushed upward by the spring constant (force) applied by the enagement surface of the follower only, not by the entire spring force of the magazine spring. This is the intent of the original Browning design. 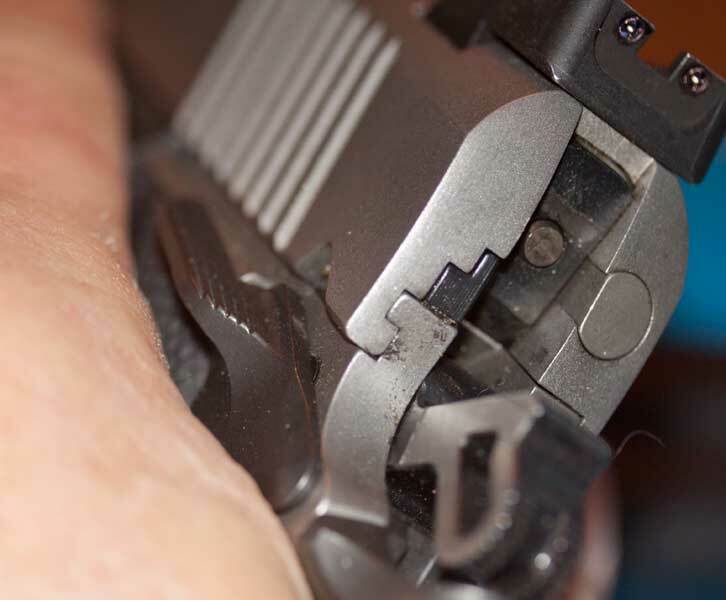 With the lesser force applied by the springy part of the follower, there is presumably less wear on the slide's slide stop notch from the slide stop when the slide stop engages the slide on an empty magazine. The SR1911 was very comfortable to shoot, based on 400 rounds spread over several sessions by two shooters. There were five malfunctions recorded: three failures to chamber, easily cleared with the classic “tap/rack/bang” procedure. The remaining two malfunctions were premature lockbacks. The premature lockbacks appeared to be caused by the excessively long slide stop lobe combined with the weak plunger spring. Clear brass markings could be seen on the lug. The oversize slide stop lug. Evidence of slide stop lug contact with bullets as they pass through the magazine. The “soft” thumb safety proved to be too easy for a left-handed shooter to inadvertently engage with the trigger finger. If the shooter is wearing gloves, the potential for a left-hand hold engaging the safety is considerable. DISCLAIMER: Both test shooters were handicapped during the accuracy test session, one with a broken strong hand little finger, the other with corrective lenses that did not permit a sharp front sight picture. Ten shot groups in two mags of five rounds each; all shots were recorded, even called flyers. Testing done offhand (no rest). Fiocchi 230 gr FMJ (Ball) 2.0"
Winchester 230 gr FMJ (Ball) 4.95"
Note: Drake believes that when his hand recovers he should be able to reduce these group sizes by as much as half. The SR1911 is a well-made, carefully thought-out expression of the Model of 1911A1. It delivers outstanding value for its modest MSRP of $799 (street price in the low- to-mid $600 range, with examples seen on offer in the $500 range). The pistol exudes quality. The configuration will not please all; however, it was intended to please most customers, which it seems to have accomplished. The use of MIM parts, while off-putting to some, is to be expected at this price point. The SR1911’s product manager has assured us that Ruger has mastered the MIM process, and that their MIM parts are as reliable as those made via any other method. Time will tell. Two components merit comment. First, the magazine catch, when firmly depressed, will “trap” the magazine and keep the magazine from dropping until some of the pressure on the catch button is released. It is a simple task to relieve the magazine catch inner surface; however, the catch should be “relieved” at manufacture. For those uncertain with a file, 10-8 Performance offers a pre-relieved catch. 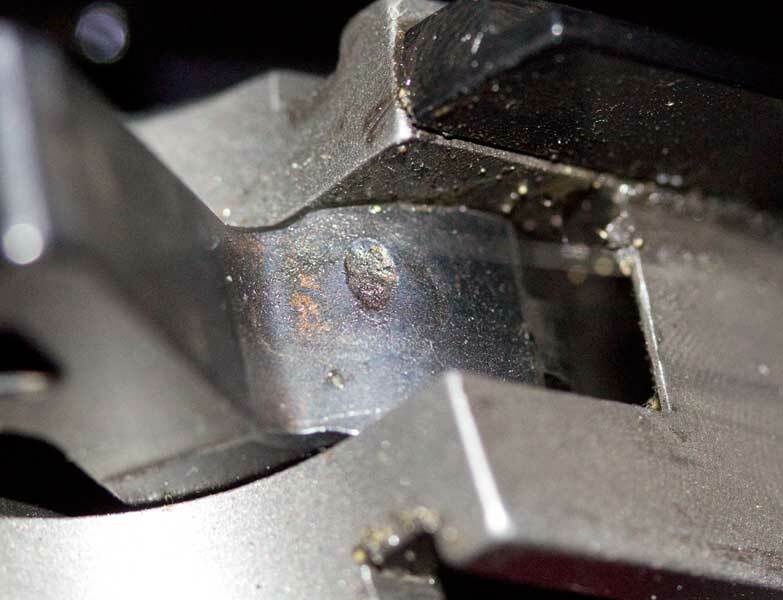 Second, the slide stop pin, or shaft, is noticeably undersized, at 0.196” instead of the nominal and desired 0.200”. This should be corrected, as it may contribute to the premature lockbacks experienced during testing. What does contribute to lockbacks for certain is the over-long slide stop lug. A revised slide stop would seem to be in order. Meanwhile, slide stops with proper dimensions are available from a number of sources. One of these slide stops is from the SR1911, the other from another major manufacturer’s 1911-type pistol. While the barrel bushing is not as tight as in a match gun, this is not a match gun. For those who wish a match fit, aftermarket bushings are readily available and easily fitted. EGW will even make you one with dimensions to order. Similarly, we have come to expect the barrel to lock up by means of the barrel lugs contacting the slide stop pin. However, in service-grade pistols such as this “standing on the link” is not only common, it also reflects the original M1911 design. Changing out the front sight may require slight modification, i.e., flattening, to the slide top just behind the front sight dovetail. As we move forward with this pistol, we will examine this area more closely. Speaking of moving forward, Drake thinks highly enough of this pistol that he has purchased this sample. 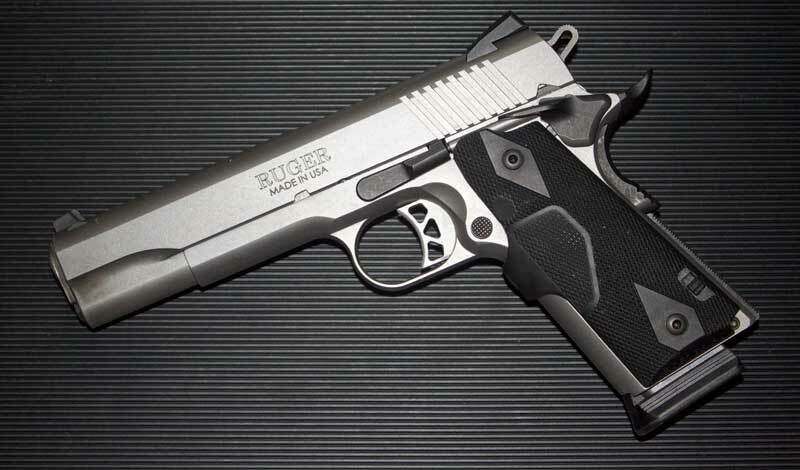 He feels that the SR1911 may be the best base pistol currently available for a custom build. To that end, he will be installing a Dawson rail so that he can use the pistol in the training he conducts at our state’s police academy. He is planning to change out the sights with a fiber optic front and a rear sight of his own design. Drake will be “texturing” the front strap in a pattern to be determined. Of course, he will replace the slide stop and relieve the magazine catch. Also, he will replace the plunger spring and tweak the thumb safety detents so that the force required to engage the safety is balanced with the force required to disengage it. Other minor refinements, as documented in our recent book, will also be made. Walt, having had this T&E pistol appropriated by Drake, has a second sample on order for his own testing and development. That pistol will not be returning to Ruger either. There’s perhaps no more sincere comment than purchasing a test article. SR1911 (above), Walt’s Larry Vickers Pistolsmith Class pistol (below). Easy to see why Walt likes the SR1911 configuration. You may use this thread to discuss this pistol and this review in our Forums Site. If you intend to buy something from Brownells, Sinclair or Police Store, please use their banners above. Whatever you buy from them, gives us a small commission, which helps us keep these sites alive. You still pay the normal price, our commission comes from their profit, so you have nothing to lose, while we have something to gain. Your help is appreciated. All times are GMT -4. The time now is 08:44.